In a close finish, Blazers’ guard C.J. McCollum scored the final seven points including the game winner to give Portland the victory. He hit a floater with 0.3 seconds left after Dallas thought they had the game in bag, finishing the game with 32 points. In a “time” usually reserved for Damian Lillard, his teammate decided to show the world why he’s the best shooting guard in the NBA. During the fourth quarter, the game seemed to be in the bag for the Portland Trail Blazers. Up by 13 with seven minutes remaining in the fourth quarter, the Blazers allowed Dallas to go on a 13-0 run and make the game close. This time it wasn’t Yogi Ferrell going off, but rather ex-Blazer Wesley Matthews and Harrison Barnes leading the way for Dallas during the run. The final minutes were neck and neck. 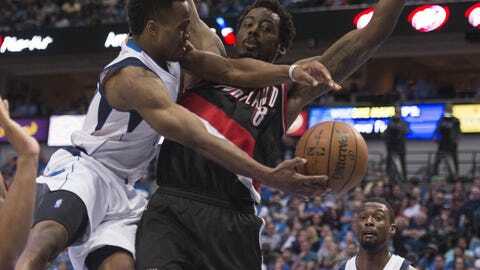 With the game tied at 103, Al-Farouq Aminu came up with a clutch steal. The break ended with a Lillard to Mason Plumlee ally-oop that seemed to steal the momentum back in the game. However, in a call back to the Memphis win a few weeks ago, Lillard committed a costly turnover. He tried to split a double team against Ferrell and Matthews, but instead threw the ball sloppily into a Mavericks break. The play cost the Blazers a huge bucket, as Matthews found Dirk Nowitzki to swish in a three. McCollum then came down and drilled a pull up jumper, putting Portland up by one. However on the following play, Devin Harris bullied his way into the lane and banked in floater. With the Blazers down by one, the Blazers went back to McCollum. The Lehigh All-Star snub blew by Dallas and put in a tough and one lay in. After the free throw, Dallas had to scramble. Running down the court, Matthews snuck up and set a knarly back-screen on Aminu. The screen freed up a wide open Nowitzki to swish in another three with four seconds left. The three seemed to put the game out of reach. However, it was McCollum again! He inbounded the ball with four seconds left and was immediately swarmed by defenders. He stretched out and split the double team, thus finding himself open with a lane to the rim. As Dallas defenders rushed to help, McCollum floated the ball over everyone to win the game. It was a crazy finish, one that seemed like the Blazers were trying to give it away. But on the night that they lose Evan Turner for an undisclosed amount of time due to a hand fracture, it’s great to leave Texas with a win.